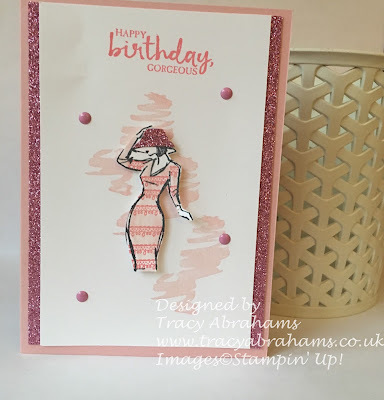 One of the lovely things about Stampin' Up! at this time of year is the Super Sale-a-Bration products that I get to play with. The latest Sale-a-bration offering includes the Glimmer Paper Assortment Pack and It's so cute with three different colours to choose from in one pack and all Free with a £45 order. 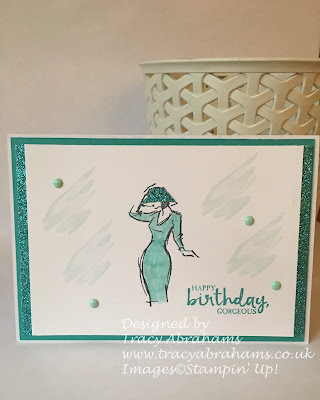 I made these cards using the lovely Beautiful You Stamp set, I stamped the images in Memento Ink and used my blender pen and some Tempting Turquoise to colour the ladies dress in, I then cut some of the Bermuda Bay Glimmer Paper to the shape of the ladies hat and popped it on the image. I the used a small piece of the Bermuda Bay Glimmer paper and popped that at the side of the Whisper White card stock. I finished off the the first card with some of the little Enamel Shapes in the Subtles colour. The second card was also stamped in Memento Ink and coloured in using some Blushing Bride Ink and my blender pen, I then stamped the stripes on the dress using the Delicate Details Free Sale-a-Bration Stamp set in Blushing Bride and like the first card I then popped some of the lovely Sweet Sugerplum Glimmer Paper at the sides of the card. The Glimmer Paper is gorgeous and the colours are so pretty. They are exclusive and only available with a £45 order as a Sale-a-Bration item and they're FREE which I think is super cool, so if you want yours you only have till 31st March to grab them. During Sale-a-Bration you can also take advantage of the Starter Kit promotion and Join the Stampin' Up! family and my team. You will get £130 worth of products for £99 plus two Free Stamp Sets. Click Join Now and follow the link on my online website. If you would like to make a purchase pop along to my online shop and place your order. If you use my hostess code NJXAGAHT I will send you out a super free gift and a hand made card. I send this out with any order of £20 or more and up to an order of £149 after this you will automatically be given the rewards to use on your order. If the amount is below this I share the hostess rewards with everyone that has purchased with me during the month and everyone gets a share of them.